Service tickets are queries / requests / complaints etc. regarding a service or a product that was supplied by the organization and requires a treatment or a reference. This tab allows to create a new service ticket and display the list of service tickets related to this Client / Supplier card. This list of Service Tickets is also used for follow up, and to update the status of the service ticket, according to its relevant representatives activity and the customers satisfaction. The table displays all of the related service tickets. 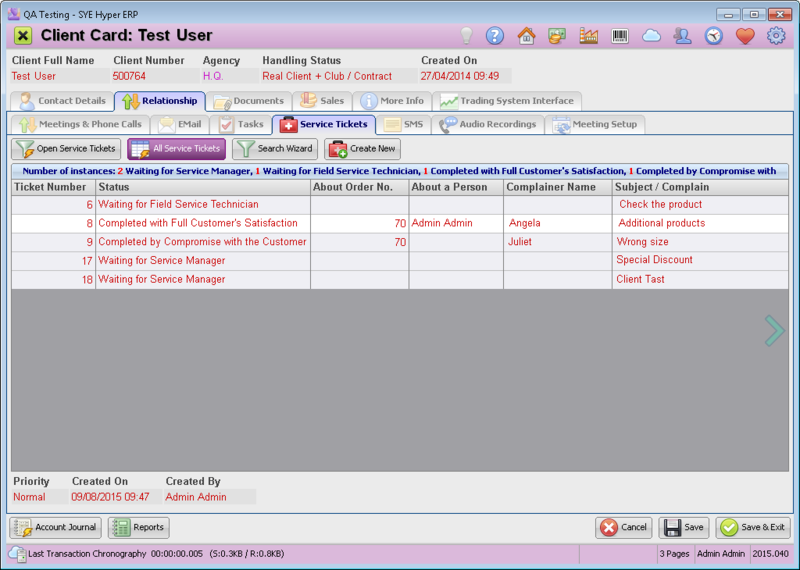 The action buttons at the top of this window, allow to display the Open service tickets only, or to use the search wizard in order to create or use a customized filter. Use the Create New button, in order to create a new Service Ticket. For further information about the service ticet, click here.